With only five days left on both our moose and sheep tags, the elusive Dall sheep was too tempting to pass up. With an abundance of pilots throughout Alaska, my brother Wade and I called a friend who had told us about a small lake, deep in the White Mountains, that he could fly us into. Our plans were quickly diminished when we learned that his plane was grounded for routine maintenance. Without enough time left in the season to make the long trek into sheep country we opted for a quick moose hunt up the shallow, braided Salcha River. Our shallow draft jet boat makes access a breeze to any stream or river over six inches in depth. 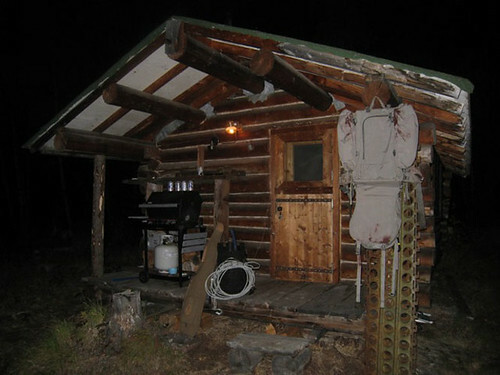 We reconfigured our plan to include our uncle’s cabin and a case of beer… not too bad for our second choice. With a short jaunt up the highway we launched the boat and cruised 60 miles upstream to a small cabin. 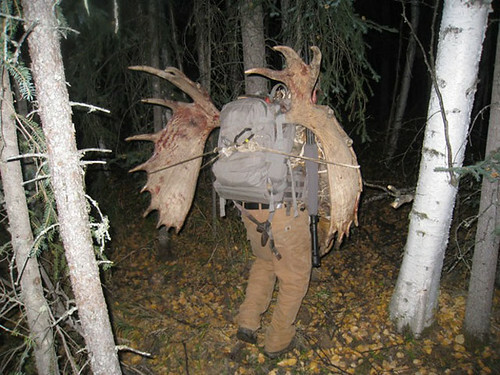 Hunting began before sunrise with the set-up of a stand in a spruce tree. With Wade perched 50 feet off the deck, I exercised the practice of cow calling and tree shaking. My attempts to mimic a bull’s horns scraping through trees were futile as nothing moved through the above average heat. 60 degrees is rare in September, so moose were beaded down for the afternoon. By evening the temperatures had cooled down, but still no luck. Another predawn start put us on the trail by 5:30, hoping to catch something before the heat. Wade was sitting in the stand as the sun breached the horizon. I employed a similar tactic to the day before, but used grass instead of trees. My extra-tuf’s tromped through the swamp and grass in a noisy random manner. I didn’t travel 100 yards before a bull let out a grunt. 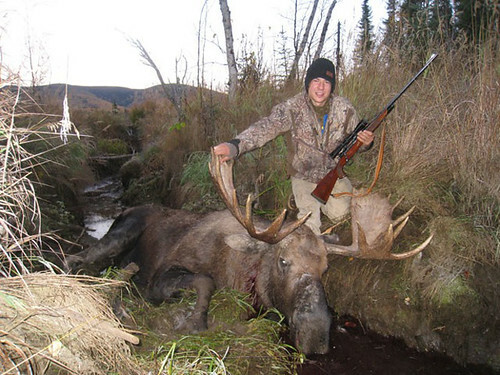 Wade then saw a bull moose walk out of the woods into a marshy area on the side of the swamp. 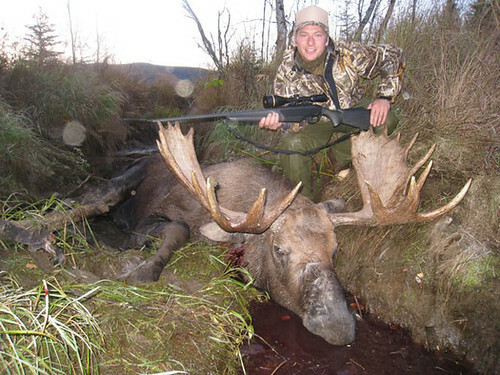 He waited with hopes of the moose moving to an area with solid ground, but lost his shot before it could happen. Once I finally saw the bull, he was walking through the trees about 100 yards in front of me. As I was following him through my scope he stopped directly between two trees and looked over at me. He had only one brow tine on the side of the rack that I could see, I paused for a second…only to loose the shot. Upset with myself for not immediately taking the shot I started to jog as quietly as I could through the woods with hopes of catching the moose on the other side before he took off. With no luck finding him Wade and I met up at the bottom of the stand to have lunch and formulate a new plan. Not wanting to leave after all the excitement we sat in and by the stand the rest of the day with high hopes of the bull returning. As the sun was starting to set we both had already replayed the missed opportunity so many times in our head that it was starting to take its toll so we decided to call it a day. As we were packing up our gear we both stopped as we heard branches cracking somewhere in the area. 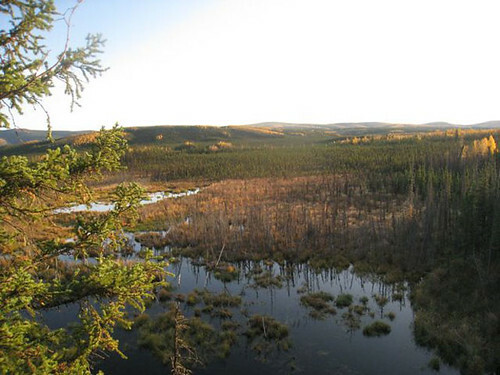 Wade climbed back up the tree to check it out only to see a cow moose sitting in the middle of the swamp. With darkness upon us we made our way quietly back to the boat hoping that we wouldn’t scare off the cow. Tuesday morning, and the final day of moose season, we woke up even earlier with high hopes that a bull had been hanging around the cow the night before and was still in the area. We pulled up in the boat with barely enough light to see our trail through the woods. As we were walking up to the stand we both heard a loud crash and something running through the woods. Not knowing how far away it was we kept walking and started calling. We immediately heard a response to our right and could see a large figure behind some spruce trees. Not knowing if it was a bull or not Wade moved to the stand and I turned towards our sighting. 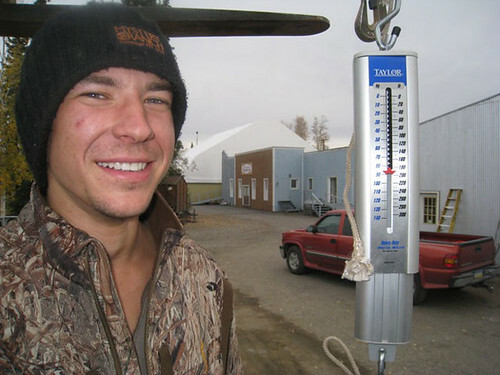 Once again the moose spooked started running, but this time it took off towards Wade. I stood and listened to his antlers rubbing on trees as he passed. He stopped about 75 feet in front of me in a position that I could glass his antlers, but not take a shot. I slowly moved towards a clearing to get a better shot, but didn’t have to go far when he doubled back right into my line of sight. I set up with a clear path and anticipated his next move. He walked directly into my corridor at 50 feet and I took the shot. He responded by running in the opposite direction. My stomach dropped, as I in disbelief missed a 50 foot shot on a 1,400lb beast. When I approached the area where the shot was taken I was extremely relieved to see that he had just fallen over into a small stream just outside my line of sight. 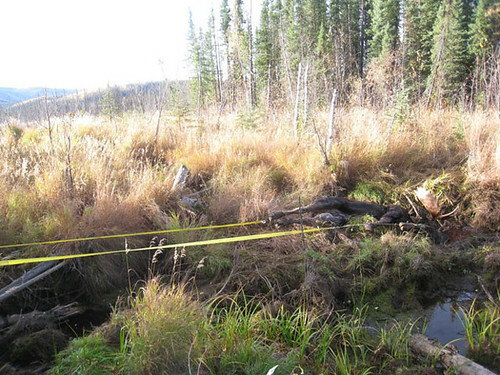 Adrenaline quickly faded into reality as we calculated the logistics of getting the moose out of this stream. 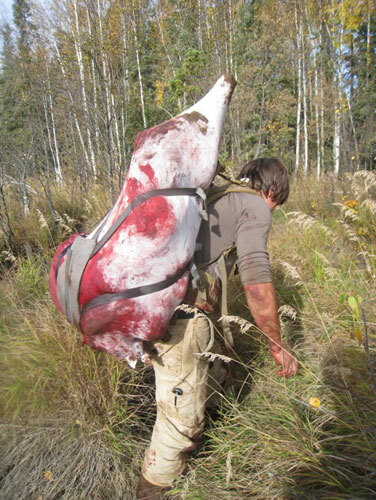 Three hours, one broken come-along, and a couple broken ropes later we successfully had the moose on dry ground. We dressed the moose out and got the first quarter off with no problem. 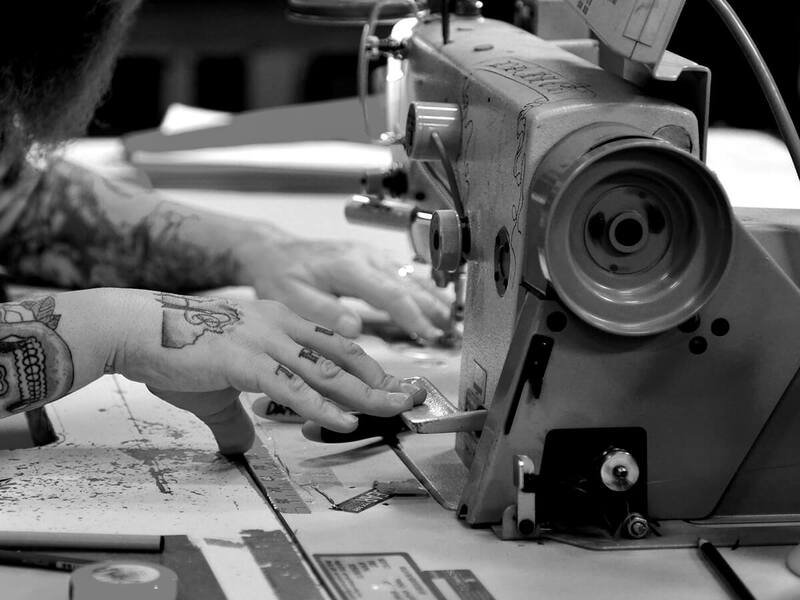 We had already decided to carry out the quarters as they came so we could save a little time by having one person carrying and one cutting. The idea was to load a quarter onto the frame and hump it out. The only problem was that the quarter was huge! We bounced around the idea that if it can fit on the load sling then we will carry it…so we removed the crew-cab from the frame and adjusted the load sling for the massive load. To our amazement the load sling straps barely fit around this enormous hunk of meet and bone. As we stood there in disbelief, with my adrenaline pumping again I eyeballed the largest load I have ever seen. Like a good brother Wade told me to saddle up as he helped lift the load to my back. 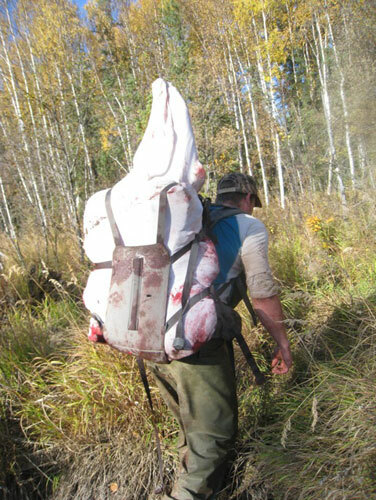 I synched down my load straps and began the tedious journey through the black spruce forest and back to the boat. It took me 30 minutes with many rest stops to cover the ¼ mile to the boat. With one load down, Wade stood up with the slightly smaller quarter number two and wrestled his biggest load back to the boat. Well deserved beers with all the meat on the boat! 190 lbs is a large chunk of meat! 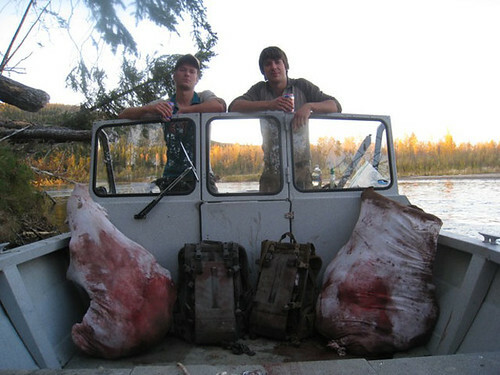 In total it took 13 hours and several more 120lbs loads before we could settle down with our PBR in the boat. 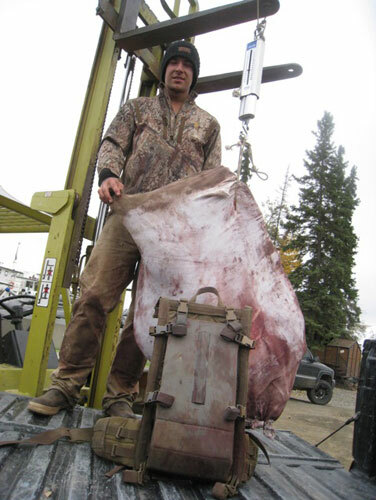 Back in Fairbanks we hoisted the quarters out of the boat with a forklift and a scale to find the weight of the first and second quarters, which were 190 and 150 lbs respectively and a total of 580lbs of meat and bone from just one moose.